A Pacific Northwest paradise on the western edge of Washington, Puget Sound is a collection of islands, waterways, and attractions that provide many fun things to do. 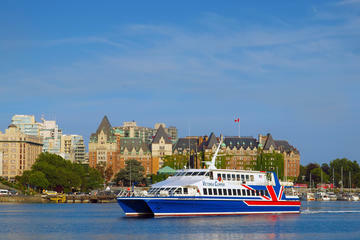 Including the San Juan Islands to the north, major cities that border the Puget Sound region include Seattle, Tacoma, and Bellingham, each offering delightful ferry rides that slip smoothly across calm salt waters to connect scenic destinations. Islands and other places to visit in Puget Sound inaccessible by ferry can be seen by other forms of watercraft, most commonly a sea kayak. Abundant wildlife, native cultures, farming communities, and numerous hidden gems of Washington all inhabit Puget Sound and the San Juan Islands, adding to a large list of must-visit island getaways. Whether it's whale watching in Friday Harbor; tide pooling at Deception Pass State Park; feasting at Tillicum Village; or enjoying Vashon Island, the "Heart of the Sound," Puget Sound and the San Juan Islands provide unique opportunities found nowhere else in the country. Plan your sightseeing with our list of the top things to do in Puget Sound. The largest Puget Sound island and one of the few accessible by car, Whidbey Island has its most famous sightseeing attraction at its northern end. At Deception Pass State Park, a bridge spans the narrow pass where funneled tidal waters create intense rapids. Deception Pass provides numerous recreational opportunities, including extensive tide pooling, scenic vista hikes, camping, and boating through the pass according to the tides. A number of Whidbey Island small towns have tourist attractions, accommodations, and seafood restaurants. The largest of these communities are the navy-dominated Oak Harbor; the historic farming community of Coupeville; and Langley, a favorite with whale watchers. Near Coupeville, Ebey's Landing National Historical Reserve preserves the rural history of the Pacific Northwest. Here, visitors will find farm life still carrying on much as it did in the past. San Juan Island is the westernmost of the San Juan Islands. The main community on the island is Friday Harbor, where ferries dock and shops, galleries, restaurants, and accommodations provide everything a tourist may want. On the south side of the island in a rural setting, the San Juan Island National Historic Park provides numerous walking trails and bird-watching opportunities alongside ample history of the region. On the west end of the island, Lime Kiln Point State Park is one of the best state parks in Washington and a popular place to explore the scenic environment. 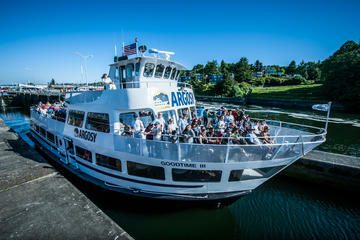 One of the most popular things to do from Friday Harbor is whale watching. Resident orcas often pop out of the waters surrounding San Juan Island and Friday Harbor, and while any wildlife watching is never a guarantee, the best way to witness these magnificent mammals is to hop aboard a professionally guided tour. Two of the most popular tours include the Whale Watching Tour from Friday Harbor and the Friday Harbor Day Trip & Whale Watching Tour from Seattle — both include an onboard naturalist. Dubbed the "Heart of the Sound," Vashon Island is a popular farming community with a strong collection of artist galleries, unique eateries, and boutique shops. Only accessible by boat, Vashon Island is connected by ferries, with docks in West Seattle, Port Orchard, and Point Defiance Park in Tacoma. Visitors are encouraged to bring their own bicycle to navigate the island's country roads, and rentals are available near the ferry terminal. On clear days, there's an excellent view of snow-covered Mount Rainier from the Point Robinson Lighthouse. Fun for the whole family, Bainbridge Island is accessed via a short and scenic ferry ride from Seattle. Also accessible by bridge from the Kitsap Peninsula, Bainbridge is a popular getaway to enjoy shopping and dining, arts and culture, and a wide array of recreational activities including cycling, kayaking, and camping at Fay Bainbridge Park. On the northern tip of the island, the Bloedel Reserve is one of the best botanical gardens in the country and features over 150 acres of intricate gardens and aesthetic structures. Other fun places to visit on the island include the Bainbridge Museum of Art, the Japanese American Exclusion Memorial, and Fort Ward Park. A great day trip from Seattle, Blake Island is only accessible by boat and helps protects a vast marine park of richly textured shoreline and beaches. Some of the most popular things to do on the island include cycling, kayaking, and staying in one of the three year-round campgrounds, all of which are backdropped by stunning Olympic Mountain vistas. By far the most popular tourist attraction of the island, Tillicum Village celebrates the Pacific Northwest American Indian culture with traditional feasts and celebrations. Tourists interested in visiting Tillicum Village can opt for a four-hour tour that departs from the downtown Seattle waterfront. Located in the San Juan Islands archipelago, Orcas Island is known for its natural beauty and recreational opportunities. It is the largest of the San Juan Islands and has several communities, including Eastsound with its fine dining, shopping, and galleries. In the small downtown, the Orcas Island Historical Museum preserves six original pioneer homesteads from the late 1800s. Donated to the historical society and moved to their present location, the cabins have been furnished with historical displays relating to Orcas Island history. For a taste of the pristine natural environment, Moran State Park offers camping and picnic sites. Most people come here either to camp or hike, as the park offers more than 30 miles of trails. Connected to the northern end of Whidbey Island by the Deception Pass Bridge, Fidalgo Island is one of the most popular launching points for exploring the San Juan Islands. Accessible by automobile from the mainland, the thriving seaside town of Anacortes can be found on the north side of the island and is a favorite destination for couples, families, and nature lovers. Popular things to do in Anacortes include bed-and-breakfast stays, perusing eclectic boutique stores, and dining on local fare. Other recreation opportunities on Fidalgo Island include summiting Mount Erie, kayaking to nearby islands, and staying the night at Deception Pass State Park. Neighboring Whidbey Island and also accessible by automobile, Camano Island is an example of quiet, rural Washington. Both Cama Beach and Camano Island State Park give beachcombing visitors easy access to the shoreline and ample hiking trails to explore. A vibrant collection of restaurants, local retail shops, and shoreside hotels can be found on Camano Island making for a great weekend getaway. Other fun activities and things to do on Camano Island include bird-watching, golfing, and zipline tours that put visitors above forested canopies. The southernmost island of Puget Sound, Anderson Island is most easily accessed with a ferry from Tacoma. This unspoiled island getaway draws less attention than some of its neighboring islands, though it offers plenty of attractions and amenities. Shopping, dining, and great hotels are found here, as well as scenic golf courses, abundant parklands, and stunning views over the water come sunset. The historic Johnson Farm on Anderson Island allows visitors to take a step back into a century-old homestead and enjoy a docent-led tour of Anderson Island history. Popular for cycling, kayaking, and spotting whales from the shore, Lopez Island is one of the lesser-visited islands in the San Juan archipelago but still easy to reach via the Washington ferry system. It's home to roughly 2,500 residents and 60-plus miles of shoreline. Visitors can find hotels, restaurants, and art galleries in the Lopez Village, and cycling around the entire island is often a full-day fun thing to do. A small but worthwhile stop, the Lopez Island Historical Museum is in the center of the village and dedicated to the island's history. On the Washington coast and accessed from Bellingham with a short ride aboard the Whatcom Chief Ferry, Lummi Island is an unspoiled and historic farming and fishing community. Trimmed with natural beaches and open countryside, cycling or hiking is a popular thing to do, and the island's farm-to-table lifestyle has gained a higher profile through sustainable fisheries and organic farms. Nowhere is this more apparent than at the luxury property The Willows Inn, a top culinary destination of the Pacific Northwest. Other happenings on the island include artists' studio tours and a Saturday Market throughout the summer featuring fresh seafood. The smallest island in the San Juan archipelago serviced by the ferry system, visitors often head to Shaw Island for its quiet beauty. The island doesn't have the usual tourist services like restaurants and hotels found at San Juan and Orcas Island, but the island community does have a historic general store and popular community library. Our Lady of the Rock Monastery is located on the island, and the nuns who devote their life to living here encourage visitors. Nature lovers prefer the island for its quiet trails, natural beaches, and campsites in Shaw County Park. Interesting Experiences in Washington: This state offers some unique destinations and things to do, from the mountains to the ocean. For ideas to help plan your trip to Washington, have a look at our list of the best small towns in Washington, or if you're more into the outdoors, consider hitting one of the top hiking trails in Washington, or simply set up at tent in the outdoors at one of the state's great campgrounds. Planning a weekend escape in Seattle? See our article on Where to Stay in Seattle: Best Areas & Hotels.